Six days later, Jesus took with him Pet er and James and his brother John and led them up a high mountain, by themselves.And he was transfigured before them, and his face shone like the sun, and his clothes became dazzling white. Suddenly there appeared to them Moses and Elijah, talking with him. Then Peter said to Jesus, “Lord, it is good for us to be here; if you wish, I will make three dwellings here, one for you, one for Moses, and one for Elijah.”While he was still speaking, suddenly a bright cloud overshadowed them, and from the cloud a voice said, “This is my Son, the Beloved; with him I am well pleased; listen to him!”When the disciples heard this, they fell to the ground and were overcome by fear. “Six days later,” our story begins. If this were a novel, the prologue would go something like this: Jesus has been sparring with the Pharisees and Saduccees, the religious elites of his own native Judaism. They’ve heard wind that he might be a prophet. They want to see for themselves. And Jesus does his usual thing, of telling them exactly what they already know and exactly what they don’t want to hear and generally mystifying everyone. “Time and again, the assumption among Christian leaders, and evangelical leaders in particular, is that the key to drawing twenty-somethings back to church is simply to make a few style updates – edgier music, more casual services, a coffee shop in the fellowship hall, a pastor who wears skinny jeans, an updated Web site that includes online giving . . .
“What millennials really want from the church is not a change in style but a change in substance . . .
Last Wednesday, bundled in my wool coat against the (unwelcome) mid-April freeze, friends and i made our way to our neighboring school, the University of Massachusetts at Amherst. Two weeks prior, UMass became home to the first out Division I basketball player, Derrick Gordon. It was a huge moment for the Pioneer Valley, and a huge moment for breaking down homophobic barriers in a traditionally masculinist, homophobic space. I sprang into action, contacting as many of my Mount Holyoke friends as i could rallying around a counter-protest. Of course, the folks at UMass were doing the same thing, but rather than giving the WBC more airplay by orchestrating a massive counter-protest, these leaders created something called #UMassUnited. A movement, a march, and a rally focused on creating an uplifting, queer-positive space that celebrated the love between people of any gender and the love of our wider community. So that Wednesday, we MHC pilgrims rolled up with our poster boards and scarves ready to join their ranks. 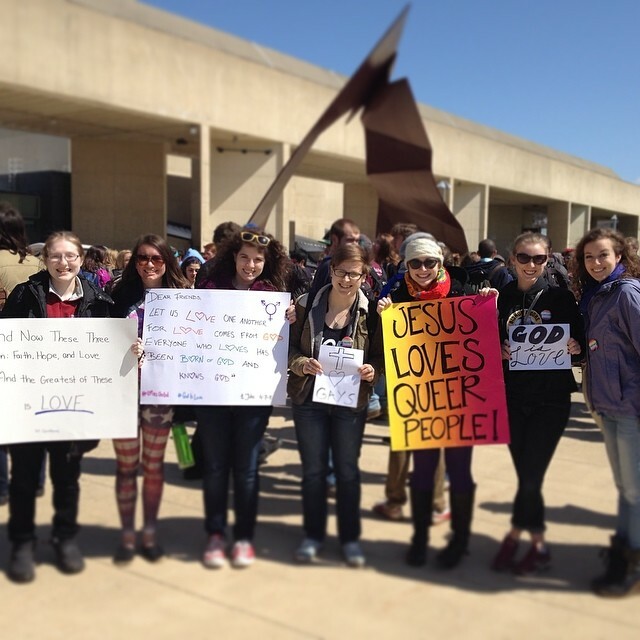 We wanted to outshine the WBC so much that our love was greater than the hate they bore on their signs. We wanted to show that Derrick Gordon is a whole human being, whose sexuality should not have to be so politicized as it is only one facet of his identity. And we wanted to embrace all among us who were scarred by the venom spewed by the WBC. That night, watching video clips and reading articles covering the demonstration, i knew we’d been successful. Almost every news outlet mentioned the #UMassUnited protest before mentioning the five WBC people who decided to show up for twenty minutes across campus. I was quite chuffed to find my own sign was mentioned here, on LGBTQ Nation, and littered across Instagram. I meant every word and i was grateful that LGBTQIA people were so excited to see a Christian in their ranks. But it was even more exciting to me to see how many other Christian signs there were in the crowd, people taking a stand for love and reclaiming a faith co-opted and corrupted by the likes of the WBC. Two of the speakers at the rally were pastors at local churches. The cohort of MHC students who i’d come with all bore signs with God-like themes: “God is Love” read one, another with 1 John 4:7 written out. It never fails to amaze me, to humble me, and to keep me faithful when so many Christians come out for queer rights. And maybe this shocks me because, as much as i agree with Rachel Held Evans’ piece, maybe we are the majority. Maybe folks like the WBC have been given too much screen time and rallies like #UMassUnited aren’t as sensational to talk about. I was working very, very hard to mean the back. The part about all of us. And as much as it singes my throat to admit it, all of us includes and included those five people from the Westboro Baptist Church. 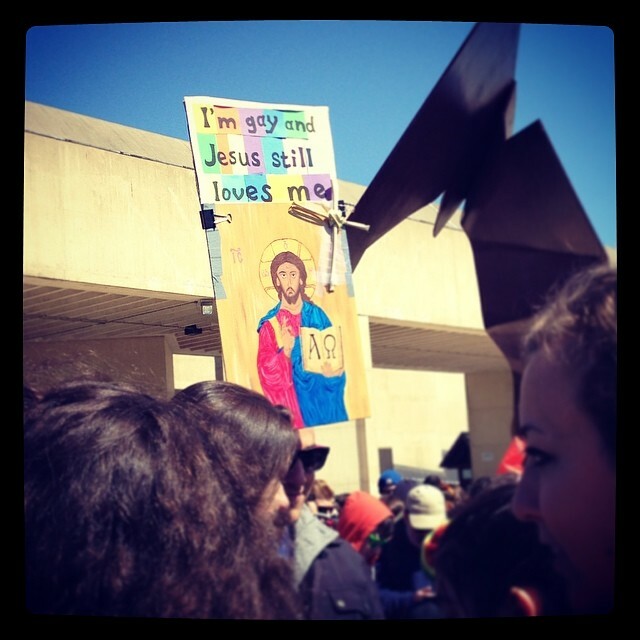 The beauty of #UMassUnited was in the celebration of love, and in the refusal to give into the hate of the WBC. I may not welcome the WBC views, attitude, language, or theology. But i’m pretty sure Jesus would still welcome them to the table. Not out of approval of what they say, but because they, too, bear God’s image. I love that. I love it because we have a religious leader who has fought injustice after injustice losing no steam as he fights the next battle. 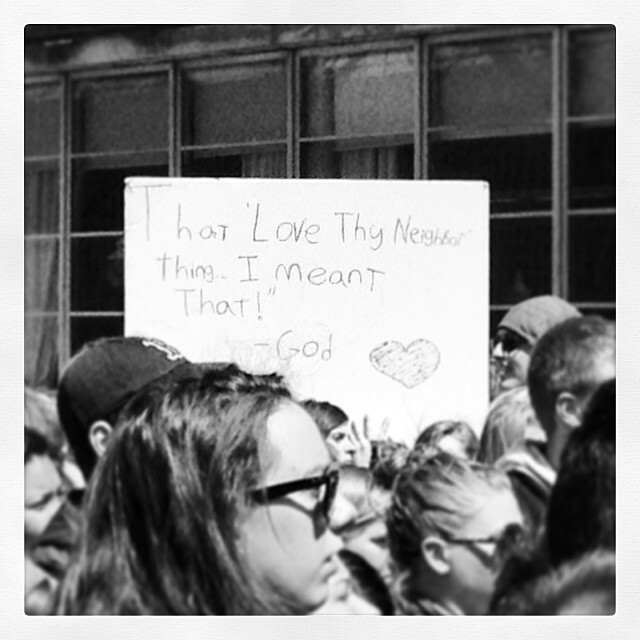 I love it because he says God loves terrorists, God loves us in our often fruitless labels. 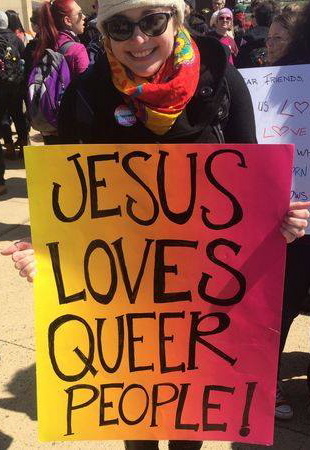 And i love it because it means God loves broken me as much as She loves Derrick Gordon and those five people who came from the Westboro Baptist church. Hate with Hate Won’t Work: Marriage Equality and Where We Go From Here. I’m the first to admit i was infuriated and despondent in the wake of the (albeit expected) news of Amendment One’s passing. It was crushing because, more than anything else, i knew we hardly stood a chance in defeating it – but i had genuinely hoped that we could overcome the odds. I knew my despair was shared among many: my new feed was cluttered with colorful language and statements of disappointment over its passing, for which, i won’t lie, i took some real comfort in. But there was also a lot of hateful slanders from these very people against those who had voted for the amendment, which was far from soothing. Rather, images that compared the counties who voted for the amendment and counties with the highest concentration of college graduated with snide captions over the lack of formal education breeding stupidity left a sour smell in my nose. In responding to those who voted for the amendment with spiteful comments about the low percentage of people with college degrees who populate their counties, or snarky remarks concerning their personhood, we are fighting hatred with hatred. Do i think they should have voted otherwise? Of course i do. Does this make me entitled to sneer and be as equally cruel towards them as they are to me? Absolutely not. Such an argument makes me no better than they are. It may be the easy choice – to go for the low blow, take the hard-hitting swing, but such a smack speaks more of my unchecked privilege than it declares my allegiance to fighting for justice. Which is why i was not comforted, vastly, by these statements. In the moment it may have been satisfying, but that’s the thing about the path of nonviolence: it is a way of life for courageous people, ergo it is not easy. I’m not trying to say everyone should believe in nonviolence or think like me (because who am i to tell you what to think?) but i do think if we’re going into this fight for the long haul, we ought to look to our forbearers and glean what wisdom we can from their victories. The last time North Carolina amended its Constitution it was to ban interracial marriage. I think, then, the ancestors we must turn to are not from the distant past, but from the immediately preceding history wherein people of all colors stood together to fight institutionalized racism. I personally thus find Dr. King’s words to be all the more relevant. Yesterday, though, the country took a turn when President Obama publicly announced he was for marriage equality. To be totally honest, my initial reaction was: “About damn time, Mr. President!” But the importance of what he was doing still resonated deeply with me. The timing of it, coming so close after the loss in NC, was clearly artfully planned – but also an enormous risk. North Carolina is a swing state in national elections; we may have voted Democrat for the first time in sixty years in 2008, but that’s no guarantee we’ll do so again. In lieu of the tremendously powerful conservative vote displayed in Tuesday’s gubernational election, i think what President Obama did was a bold, and thus all the more commendable, action. But he’s not the only one working for this. The most powerful response to Amendment One’s passing that i have yet seen came from an Episcopal bishop,* Bishop Curry of North Carolina. His words are pointed at all sides of the fray; he takes a religiously-founded stance for marriage equality but also holds his comrades in this accountable in decrying those who have said hateful things to the people who voted for the amendment. Whether or not you’re a person of faith (and not that my opinion on your autonomous decision matters but, for the record, i still love and value you and your rights even if you are not a person of faith) i highly encourage you to watch his response. further things of interest: a petition to repeal amendment one; also, a counter-voice critiquing the slippery language of president obama’s marriage equality statement. current jam: “tomorrow will be kinder” the secret sisters, from my playlist in response to the amendment’s passing. *For friends who may or may not know: the Episcopal church has been at the forefront of the religious fight to ordain people of queer identities (you can be gay and/or female and still be a priest in the Episcopal church).